Orange County Supervisor Lisa Bartlett is administered the oath of office by former Supervisor Marian Bergeson. Also pictured are (from left) Supervisors Todd Spitzer (vice chair), John Moorlach, and Shawn Nelson (chair). 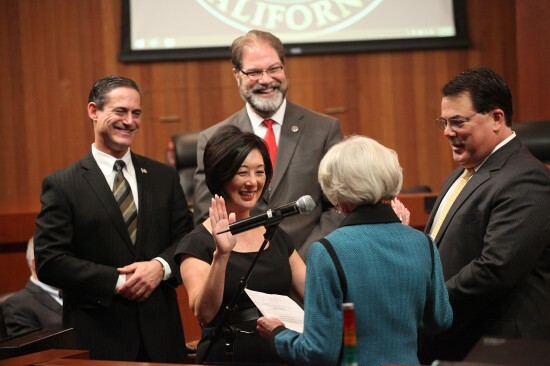 SANTA ANA — Lisa Bartlett was sworn in last week to the District 5 seat on the Orange County Board of Supervisors, becoming the first Japanese American to serve on the board. After being overwhelmingly elected Nov. 4 by South County voters as your new 5th District supervisor, I was honored to be sworn in Tuesday, Dec. 2, before an overflow audience of supporters at a special meeting of the Orange County Board of Supervisors. Administering the oath of office was my dear friend and mentor, the honorable Marian Bergeson — former state senator, secretary of education, and 5th District supervisor. I was pleased to take office a month early to fill the unexpired term of Supervisor Patricia Bates, who was chosen by voters in the same election to represent the 36th Senate District. As I join a new Board of Supervisors that will lead the county in the coming years, it is important to reflect on this mission and these values. I am enthusiastic to begin this journey and look forward to working with my colleagues on the Board of Supervisors to continue making Orange County an efficient, fiscally responsible, and safe place to live, work, and travel. Along the campaign trail, I met many wonderful people who care deeply about the future of our county and what we will leave behind for future generations. Now that the long race is over, I will focus my attention to representing the people of 5th District. You have my solemn commitment to continue to strive to achieve the most positive and productive results possible for the residents I serve, much as I did as the former mayor of the City of Dana Point. Needless to say, I have extremely big shoes to fill after the well respected and passionate public servants who held this seat before me, including former Supervisors Tom Riley, Marian Bergeson, Tom Wilson, and Patricia Bates, who now represents us in the State Senate. Sen. Bates and those before her worked diligently to leave the 5th District better than when they began representing it; and I will endeavor each and every day to do the same. In closing, I am privileged and humbled to represent the fabulous 5th District and hope you will join me and my board colleagues in working to make Orange County, America’s sixth-largest county, a place all of us can be truly proud of! Please don’t hesitate to contact me at (714) 834-3550 or [email protected] if I can ever be of assistance.